You will be given a Free reference e-book to read which has 532 pages And the test will be based on that e-book. MCITP Windows Server 2008 server administrator certification is capable of proving that you have a comprehensive and extensive set of skills in performing IT job roles especially those that involve the use of Windows Server 2008 and effectively administering it. A certified expert in this field is wholly responsibly in operating and managing Windows Server 2008 infrastructure. If you plan to become a Microsoft Certified IT Professional (MCITP) who focuses more on administering Windows Server 2008, then note that your responsibilities will include the management of the web, IT application servers and the entire infrastructure. You will also be responsible in utilizing batch files and scripts that are written by others as a means of successfully accomplishing all your tasks regularly. Your tasks will also include conducting some of the most essential server management tasks including managing the entire operating system, directory services and files, distributing software and updates and monitoring and profiling all assigned servers. Your responsibilities also include troubleshooting, supporting all engineering projects and configuring the server. The good thing about trying to understand the scope of work of a Microsoft Certified IT Professional with focus on Windows Server 2008 administration is that you can conveniently seek the assistance of the free MCITP Windows Server 2008 server administrator practice course established by Brainmeasures. With the well-developed free study guide and practice test included in this free practice course, working as a competent expert and professional in the field will never be that difficult. 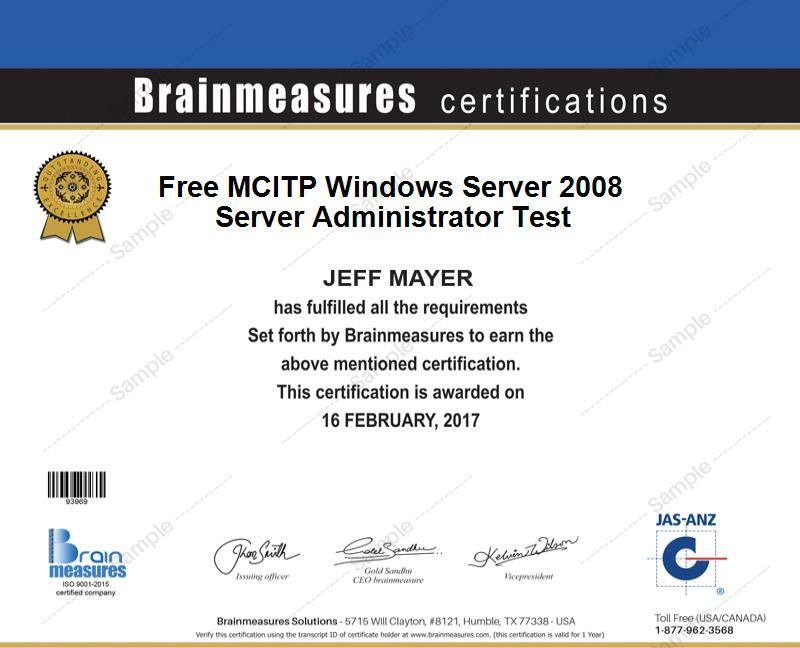 The free MCITP Windows Server 2008 practice course offered by Brainmeasures comes with a free MCITP Windows Server 2008 server administrator test which will serve as your ticket towards knowing what it really takes to take and pass the actual certification exam. The free study guide included in this free online certification practice course is also highly impressive because it covers all the vital topics that are mainly covered in the actual certification exam. The study guide introduces you to the most essential concepts and terms associated to working as an MCITP Windows Server 2008 administrator, the functions and major roles played by Windows Server 2008, how you can efficiently administer the server and how you can use it while ensuring that the most favourable results are enjoyed by an enterprise. The free practice test is also a major help in allowing yourself to be completely prepared when taking the somewhat challenging certification exam. How to effectively plan for server deployments? How to effectively monitor and maintain network infrastructure servers? How to efficiently monitor and maintain print and file servers? How to create a good plan that will enable Windows Server 2008 to have the highest level of security? Hundreds of individuals and professionals will surely enjoy enrolling in the free MCITP Windows Server 2008 practice course offered by Brainmeasures and taking its featured free MCITP Windows Server 2008 server administrator test since this works in letting them enjoy better chances of passing the actual test. This practice course is primarily designed for all aspiring Microsoft Certified IT professionals, Windows Server 2008 administrators, Windows Server 2008 consultants and server engineers and managers. Being a holder of an MCITP Windows Server 2008 server administrator certification also entitles you to enjoy a higher salary bracket. Working as a Microsoft Certified IT professional, for instance, gives you the chance to earn an average annual salary of $75,000. Using your certificate to work as a Windows Server 2008 administrator enables you to earn approximately $68,000 to $116,000 per year.